This is the knitting project I started when I was coming out of my malaise some months back. 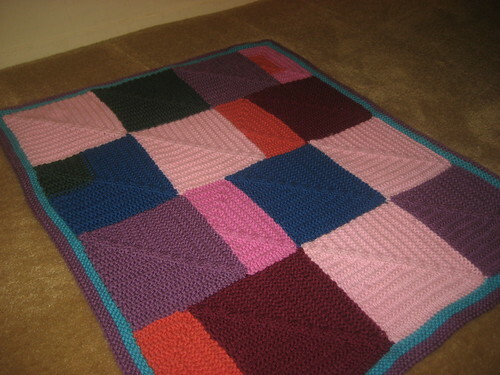 It’s a wee blankie for the then-newborn daughter of a friend. Even though this blanket is quite small as blankets go (about two feet by a foot and a half), it took me four months to finish it. I quite liked working on it when I’d make the time to do so; I just didn’t manage that very often. For the pattern, I used the rectangle and big square units from the Children at Play pattern by Sharon Stoner, from the book Babies and Toddlers: A Knitter’s Dozen, and combined them in a simple layout of my own devising. (You can see them in something much closer to the layout the author devised here, in the first project I made based on that pattern.) I gave myself the challenge to only use Knit Picks Swish yarn that I had on hand, my leftovers from other projects, which limited my color choices and forced me to get creative when I ran out of a couple colors mid-shape. It was fun, though I will admit to browsing the Knit Picks catalog during the process and thinking how nice it would be to have some of the new colors to use as well. So far I’ve resisted ordering any; go me!